Bill Kristol asked his Twitter followers to consider, quote, “the contrast between the calm dignity and quiet strength of Mr. Phillips and the behavior of MAGA brats who have absorbed the spirit of Trumpism.” And then, when the actual facts emerged, Kristol quietly deleted his tweet. He never apologized of course. He hasn’t apologized for the Iraq war either. There’s no need, people keep giving him money. Last, but not least, was New York Times columnist Kara Swisher. “Swisher went to Princeton Day School and then Georgetown and then got a graduate degree at Columbia (…) Is she more privileged than the boys of Covington Catholic at Kentucky? Of course, she is. Maybe that’s why she feels the need to call them Nazis which she did repeatedly,” Carlson concluded as he moving onto discussing the topic with guests. 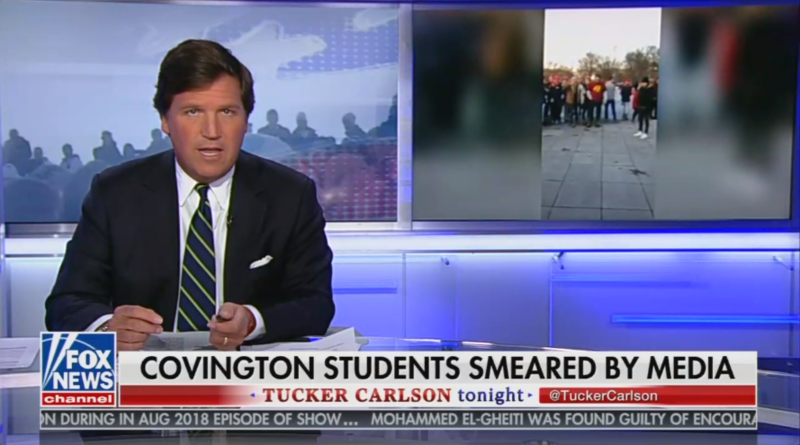 TUCKER CARLSON: But did the video really describe what happened? That should have been the first question that journalists asked. Checking facts and adding context is what journalists are paid to do. It’s in the first line of the job description. And yet, amazingly, almost noble in the American media did that. And that’s a shame because there was a lot to check. The full video of what happened on Friday in Washington is well over an hour long. The four minutes that made Twitter don’t tell the story but, instead, distort the story. Now the footage seems to suggest the boys were unsure of whether Phillips was hostile or taking their side against the Black Hebrew Israelites. But, in any case, there is no evidence at all that anybody said build a wall. Here’s a selection of what didn’t make social media. What we know for certain at this point is that our cultural leaders are in effect bigots. And they understand the reality on the basis of stereotypes. When the facts don’t conform to what they think they know, they ignore the facts. They see this country not a group of people or of citizens but as a collection of groups and some of those groups they’re convinced are morally interior to other groups. They know that’s true they say it out loud. And that belief shapes almost all of their perceptions of the world. It’s not surprising then that when a group of pro-life Catholic kids, who look like lacrosse players and live in Kentucky, are accused of wrongdoing the media don’t pause for a moment before casting judgment. Hollywood film producer Jack Morrissey tweeted that he wanted the boys killed. Quote: “MAGA kids go screaming, hats first, into the woodchipper.” And then he paired that with a graphic photo. Actor Paton Oswald liked to personal information about one of the boys, in case anyone wanted to get started on that project. But in case you think the response was entirely from the left, you should know that the abuse was bipartisan. It wasn’t just left vs. Right. It was the people in power attacking those below them. As a group. Plenty of Republicans in Washington were happy to savage the Covington kids probably to inoculate themselves from charges of improper thought. Consider Kara Swisher, for example, she’s an opinion columnist at The New York Times. Swisher went to Princeton Day School and then Georgetown and then got a graduate degree at Columbia. She has become rich and famous in the meantime by toadying for billionaire tech CEOs, she’s their handmaiden. Nobody considers her very talented and she is somewhat highly influential in our society. Is she more privileged than the boys of Covington Catholic at Kentucky? Of course, she is. Maybe that’s why she feels the need to call them Nazis which she did repeatedly.